Apart from injuring himself, his actions can cause problems for a lot of people. to hospital and treated. What did he gain by his trespass and daring entry into poor surf? Nothing, as soon as he dropped in he was washed almost to the beach. When I look back on 2004 in relation to the policing of Portreath I have to conclude that it was a relatively successful year. With one or two notable exceptions we did not experience the same levels of anti-social behaviour and damage in the village that we endured in 2003. This is backed up by the figures, which show there were 20 crimes less in 2004 than the year before. I am pleased to say that there were relatively few incidents for us to attend to in Portreath over the Christmas period just 6 crimes were reported for the whole of December. During 2004 I met with the Parish council and other groups on several occasions to discuss ways of making the best use of available resources to improve the quality of life for Portreath residents. A few of the proposals that we discussed were: - Improving and extending the CCTV system that currently covers the car park so that it covered the majority of the village. Introducing a paid policing scheme (as successfully operated in other parts of the county) to provide a guaranteed police presence in the village every Friday and Saturday night throughout the summer (in addition to the normal service). Making an application to restrict anti-social drinking in certain areas. Unfortunately it was not possible to implement any of these initiatives last year. However I am fully aware that these things need careful consideration and that they cannot happen overnight. I am sure that some of these proposals will be taken forward this year and I look forward to working with the appropriate organisations to assist in the implementation process where ever possible. May I wish you all a very happy, healthy and safe 2005. Hello there! Resident Brownie Mouse reporting. I thought I would fill you in on what’s going on at the First Portreath Brownie Pack these days. I like to spy on them on a Monday evening in the school hall – they have so much fun!! Of course, it wouldn’t do for me to be seen, (not with all those owls about), but I like to sit in a corner and watch the proceedings and, more often than not, those kind Brownies leave a few crumbs for me to nibble at when they’ve all gone home – they like their food, you know – always bringing in cakes, biscuits and chocolates ! Well, they’ve been very busy this last term, particularly in the art and craft area, decorating some beautiful new bags to keep all their things in, making necklaces and bracelets out of beads, painting Christmas sun catchers and making Christmas cards. Consequently, quite a few of them have received their Craft Badges. The Brownies have been very musical too, enjoying an evening of musical games and competitions, using lots of very loud percussion instruments. I had to hide in my hole when it got too noisy! The Brownies have had visitors to the pack, too. Recently, Kerrier On-Track visited to speak to them about bullying and how to deal with it and on another visit, Kerrier On-Track spoke about friendship and team-building; the Brownies were very keen to hear what was said and enjoyed participating in all the team-building activities and discussions. The Brownies have also been learning about how other people cope with various disabilities and have been taught some sign language by another visitor to the Pack whose name is Tammy and she was very friendly. These are serious words, aren’t they? But I’ve heard several new Brownies quoting them at their Promise Ceremonies. These are when the girls get to be proper Brownies; their friends and family come to watch them say their Brownie Promise and it’s a really special occasion, (especially for me as there is always lots of food about !). The Brownies have also been very fortunate in receiving a generous donation from the Harbour Fun Day Committee and because the Tax Man apparently gave them some money (I didn’t quite understand this part, that the tax man GAVE them money …) however, it seems this means they can all go to the Red Riding Hood pantomime in February – lucky girls ! The Brownies went out and about in November, joining in the Remembrance Day Parade through Portreath, followed by the service at St. Mary’s Church. I must say, they all looked very smart and it was good to see so many young people remembering the sacrifices made during the wars. The Brownies were at St. Mary’s again recently, participating in the Christingle service. This was a wonderful occasion, with lots of lively singing, dancing and drama. The Brownies stood up at one point and gave thanks to God for all the things they are grateful for. Then, all the children lit their Christingles and the church looked radiant in the candlelight. Well, I must be off now; I’m getting ready for the Brownie Christmas party – a riotous occasion, if last year is anything to go by, but I’m looking forward to the fun and games and (you’ve guessed it) the FOOD. Sylvia & Rod brown wish to thank all local businesses and individuals who have supported the club in the past twelve months and look forward to seeing more people in the coming year. We will be holding BINGO sessions in the Portreath Millennium Hall on the following Friday nights. On Sunday 12th December, a group of independent volunteers from the village cleaned the main beach, the little beach and part of the stream near the Basset Arms. We had decided that we were fed up with waiting for official bodies to get on with the cleaning so we thought we would do it ourselves. We put some posters around the village and Sara rang Kerrier who were very pleased to donate black bin bags, gloves and grippers. On Sunday morning, we walked down to the meeting point by the café near the beach expecting to be the only people there. But in the end about 16 people turned up- some very young ones- and rapidly set to work. After about 2 hours, it was very satisfying to leave a now spotless beach and loads of full bin bags and assorted rubbish by the litterbin for the Council to collect as agreed. We were so pleased with what we had achieved that we all decided we should do this on a regular basis. So watch out for posters and join us next time: it does not take long when we all get together. It felt great to do something positive for the village. Thank you to everyone who joined us on Sunday. SUNDAY 11th FEBRUARY AT 11.00 A.M. In mid October 2004 a large chunk of Western Hill slid down to the sea taking with it a large nesting area used by Fulmars and completely burying one of the Bassets Bath pools. The Fulmar colony have used that part of the cliff for breeding because of its inaccessibility to predators, now with the slope that has been formed and the lack of ledges, they will have to move on. The Fulmar is Amber list criteria, meaning, a historical population decline during 1800-1995, but recovering; population size has more than doubled over last 25 years. The Bassets Bath known as The Mermaid Pool will, I doubt, be seen again in any of our life times. The cave in which it was located is directly under the slip and probably contributed toward the weakness in the cliff. In recent weeks there have been further smaller falls causing concern from the National Trust. They have now erected warning signs asking people to keep clear. The slip spoil on the beach is also unstable and not suitable for climbing. Portreath Badminton club has been meeting every Tuesday night since October in the Millennium Hall and it has been great fun. We have about 16 members now, of varying abilities from regular players to complete beginners. The annual membership fee is a mere £15, which gives you insurance through the Badminton Association and each session is £2 per person. It is possible to attend as a guest before you have to join, so come and try it out. At the moment, we are only playing on Tuesdays, but it is possible to book the Hall at other times according to availability. We have received a generous grant from the P.I.C. this has enabled us to buy a net and some shuttles so far. Two weeks ago some of us repainted the white lines to the correct specifications and Tony, a Badminton coach usually comes along to give helpful tips. The Parish Council was very concerned to learn that Kerrier District Council had taken the decision to cease opening the public toilets near the Beach on Sundays throughout the winter. As it was felt that this decision would cause great difficulties, not only for local residents but to the many people who visit the Village over the weekends during the winter period, the Parish Council felt every effort should be made to keep the toilets open on Sundays and, having ascertained that there would be appropriate insurance cover, Members resolved to make monies available to ensure that the toilets were unlocked on Sundays throughout the Winter period. Members have been assured that work to implement the various traffic calming measures, already discussed and advertised locally, would be commenced within the next few months. It is hoped that these measures will go some way to reduce the speed of traffic along Penberthy Road particularly in the vicinity of the School. The County Council will be giving consideration to additional calming measures along Beach Road in the near future. Consideration was given to the setting of the precept for the coming financial year and Members were anxious that there should be no great increase in the Community Tax for local residents. After a full discussion it was resolved that, in view of increasing administration charges relating to Insurance cover, etc., and probable increases in the charges made by Contractors carrying out the litter picking and footpath trimming within the Parish, there should be an absolute minimum increase in the precept which was set at £6,700, an increase of approximately 10% over last year's figure. It was pointed out that this would, probably, still be the lowest precept of all local parishes within the Kerrier Area. Members are of the opinion that some consideration should be given to the improvement of Sunnyvale Road in view of the every-increasing usage of this busy highway. The number of vehicular accesses off Sunnyvale Road is increasing rapidly and, with the promotion of the Mineral Tramway cycle path, the situation along this narrow highway is becoming more and more dangerous, particularly as some of the cyclists are very young children. An approach has been made to the County Council via the local County Councillor Mr. T. Rowe and it is hoped that some method can be adopted to ensure the safe passage of all users of this much used route, possibly by the segregation of the cyclists from the vehicular traffic. The County Highway Engineer has also been made aware of the fact that a section of the highway in the vicinity of Sunny Corner needs urgent reinforcement. We hired an Age Concern Mini-Bus for the group Christmas trip to Presingoll Barns at St Agnes, on Thursday 2nd December. These vehicles include aids to mobility & specially selected drivers, something much appreciated. The Group meets in the back room of the Millennium Hall on Wednesday afternoons between 2 & 4 pm. Everyone welcome, light refreshments provided. Is anyone interested in being coached by Tony Poole, County Badminton Development Officer? The sessions would take place in the Millennium Hall, possibly on a Thursday evening, 10 sessions costing £20 per person. The Portreath Improvements Committee has agreed to pay for a litter picker every month over the winter, and twice monthly during the summer. This means that between the Parish Council and the PIC, the village will have a litter pick every two weeks over the winter and every week over the summer. Unfortunately Kerrier District Council have decided not to replace litter bins that have been vandalised, one in front of Tabbs restaurant and one at the top of Tregea Hill. Consequently, if you see or are concerned about an area within the Parish that you think needs attention, please call Kerrier District Council on 01209 614332 / 333. Kerrier are usually very prompt in their response, especially when informed of rubbish clogging the stream along Tregea Terrace. Kerrier District Council's decision to close the beachside public toilets at Portreath on Sundays has been overturned following protests from villagers. Ken Bowden, Chairman of Portreath Parish Council, said that he and his Clerk, Jean Oates, had persuaded the Authority not to continue to close the toilets during the winter after talks with council officers. He said: "I took the matter directly to the chief officers of Kerrier and at the end of the evening they agreed that Portreath was a slightly different case. Two of the beaches belong to Kerrier – as does the little harbour beach and some of the main beach - so they have an obligation to keep the toilets open." Recently, Graeme Hicks, Kerrier Council's portfolio holder for the environment, had said that vandal-hit conveniences would be shut on those days during wintertime in a move to make budget savings and help prevent a hike in council tax bills next year. He said that after a public consultation the Authority had decided to focus on regeneration, quality homes and open spaces and that keeping some public lavatories closed on Sundays would create "substantial savings". Mr Bowden stepped into the debate after the authority closed the public toilets at Portreath on two Sundays in a row saying. "When you've got 50 to 100 cars in the car park and 100 people on the beach at Portreath on Sundays, the pubs and restaurants in the village would not want to tolerate that many using their toilets for too long. It's going to perhaps cost the Parish Council £20 to keep the toilets in the village open on a Sunday." The remains of a suspected hammer-head shark found washed up on Portreath beach has been making waves in the marine world this week. Kevin Melton stumbled upon the head of the shark in the harbour in what experts described as only the second discovery of a hammer-head in Britain since records began. As marine researchers hailed the find as one of the most exciting in recent times, the head has been undergoing a detailed examination at the Plymouth-based Marine Biology Association. Mr Melton said that he had received a series of phone calls from shark experts, one of whom believed the hammer-head was only the second confirmed sighting of the species in Britain for almost 120 years. 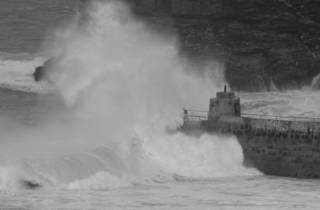 He said: "I was just walking back from the cliffs along the harbour when I saw it. My wife, Sharon, thought at first that it was a big crab. I climbed down the ladder, recognised it as the head of a hammer-head shark and brought it back home." After alerting marine staff at the Blue Reef Aquarium at Newquay, Mr Melton was advised to store the head in his freezer to help preserve it. Ruth Williams, a marine conservation officer for Cornwall Wildlife Trust, said the rare find had triggered great interest. "It is very exciting," she said. "As far as I know, there has only been one previous recording of a hammer-head shark around the UK. Usually, they are seen as tropical or sub-tropical sharks. It's either just wandered off into our waters and died of natural causes or in fishing nets. Or it could have been swept here. Either way, it's died somewhere close to the South West." Mrs Williams said that Dr David Sims, a shark expert, was due to carry out tests on the head and hoped to establish its species, age and any injuries the shark suffered. Becs Smith, a senior aquavist at Blue Reef, said that hammer-heads spent most of their time combing the sea floor for fish, including stingrays, and posed 'very little' threat to people. "Sharks are usually more scared of us than we are of them," she added. "We are getting lots of different species around our coast including amber jacks - they are related to tuna - which were caught in the UK recently. It could be a sign of warmer water temperatures." Portreath fell silent for a short period on Sunday afternoon, the 7th November, as the village paid tribute to those who have died in two world wars and other conflicts. With standards fluttering in the autumn breeze, the procession marched from the sea front car park to St Mary's Church to the sounds of Illogan Sparnon Band. At the war memorial, wreaths were laid by groups and dignitaries, including the parish council, Portreath Improvements Committee, Brownies, Sea Cadets and RAF Portreath. Last Post and Reveille were played by Jessica Hutchens and Naomi Goldsworthy, two young members of the band. After a service in the church led by the Rev Mike Kippax, refreshments were served in the institute. A new orienteering course has been completed at Tehidy Country Park, Camborne, offering visitors a challenging way to explore its 250 acres. It took Cornwall County Council's Countryside Service nearly two months to complete and consists of 35 posts made-up of both short and long courses. Park Ranger, Tony Sciascia, said: "Anyone can use the course and it's a great way to get fit. Visitors can buy a map for £1 and either do the course by themselves or as part of a group. In the past, we have had many people use the old course including students from schools and colleges, the Scouts and cadets and even trainees from the fire brigade." The map can be bought at the Tehidy visitor centre or by calling 01872 323 963. Bookings can also be made on this number. Tehidy Country Park was once part of the estate owned by the wealthy mining family, the Bassets. It was bought by the county council in 1983 and turned into a recreational country park. Visitors can stroll around the lake, explore leafy glades or wilder areas of woodland or be immersed in the rich flora and fauna. The park hosts a variety of facilities, including an events field, where a range of activities are held, BBQ hire facilities in a designated woodland, a summer and winter events programme, outdoor education facilities, and a schools' and youth campsite. Yes, it’s January and that means the Portreath Improvements Committee elections are upon us once again. This year, two of our long serving officers are standing down from their respective positions. Connie Trewella has been the PIC Treasurer for many years and has done an outstanding job and Nigel Mathews has stood down as Chairman, after eleven years of dedicated service. Both Connie and Nigel will, we hope, remain members of the PIC. This past year the PIC has for the first time for many years had a full committee and as a democratically elected body every member stands down and puts up for election every year. We need members that are prepared to attend the majority of meetings throughout 2005. These are held on the second Monday of each month. The main order of business at the meetings is to make decisions on the best use of the income created by the sea front car park, which is owned by the PIC. This is a substantial sum and the Constitution states that the income is to be spent for the good of Portreath village and it’s residents. Consequently the agenda at the monthly meetings can be extremely varied, ranging from litter picking and property maintenance to long term financial investment and constitutional matters. Another responsibility is the day to day running and management of the sea front car park. This is carried out by the Portreath Association Ltd. (PAL), a small limited company that was formed because by law, a charity (the PIC) cannot trade to make a profit. Five people run the PAL, three of whom are elected at the March meetings (they are elected from within the membership of the Portreath Improvements Committee) the other two members coming from the board of directors of the PAL. giving your name and address, and the name and address of two village residents aged 18 or over, who will support your application. If you can’t spare the time to put yourself up for election, please still come along to the Portreath Institute on the 24th of January at 7:00pm and vote for the residents you would like to see sit on the committee. There are 24 seats available and the rules of the PIC allow all village residents aged 18 or over to vote for up to 24 fellow residents. Voting slips will be passed around on the night. Currently the January meeting is only time residents can attend the PIC meeting, so this is your chance to ask questions and put suggestions forward other than in writing, which you can do at other times in the year. For those of you who would like more information about the Portreath Improvements Committee, there is a brief history printed on page ? As you can see, the Portreath Improvements Committee is a major influence within the village and needs your support. Please come along on the 24th of January at 7.00 and vote for those you want to represent you for the coming year. In the coming months, as we work on our publicity, you will be hearing more about this exciting initiative! We have been running for almost nine months and in that time a number of projects have begun in the village of Portreath. On Wednesday CHIC (Care and Hospitality in the Community) meet in the church between 10-12.00. People can 'pop in' for a cuppa, a chat, to be quiet or to seek advice and sign posting to resources and services on a number of issues. The Veg Box scheme also runs from CHIC and between 28-32 people per week collect their value veg box from the church at around 11.15am. In the process they support local growers and farmers. the boxes are great value at £4.00. We have organised a trial cooking group from CHIC, this went well and may start as a regular Wednesday lunch time group in the future. Incline also supports COG, the Community Outings Group, the 'Over 50's Group' who meet on Wednesday afternoon in the Millennium Hall and Mish Mash an exciting once a month club for children aged 4-11 years. On December the 4th, Mish Mash hosted a community feast at the school, the children shopped for and prepared the food and enjoyed a morning of activities and action with members of the community. In January there will a belly dancing class starting at the primary school, this is a project Incline are currently developing with Family Learning and is open to anyone in a family group (at least two generations need to attend for free admission). The Incline Church Community Project has secured funding to develop further and very soon, will be supporting a new group for people who are Carers in the village. We now have our own logo, at the top of this article and please do look out for posters and leaflets that should be appearing early in the Spring. Our next meeting is on the 16th February 05 in the Church Hall at 7.30p.m. If you would like to know more, do come along or phone Terry on 843181 or Treve on 610260. We want to work with existing groups, develop new ideas and promote the wellbeing of our community through social action and developing individual and group ideas. Do come and talk with us if you have an idea you would like to develop. A surprise presentation was made to the retiring chairman of governors of Portreath School, when parents and children gathered for the Christmas lights switch-on. Jean Oates was expecting just to throw the switch and join in the singing of carols, but found herself thrust into the limelight once more as the school presented her with a gift in gratitude of her decades of service. The picture, a pastel drawing of Gull Rock, was specially created in her honour by local artist Peter Skinner. "It was a big surprise," she said. "I only went down there to turn the lights on. It was a lovely occasion, particularly as it took place in 'Sarah's Garden'." Even county council records do not show exactly how long Mrs Oates has been a governor at the school, but her association there extends beyond 30 years. She began by running the playgroup, and when her own children joined the school, her involvement increased. She joined the governors, and within a short time became chairman. She relinquished her role last term, believing the 'time was right', but is adamant she will keep in touch. She said: "I will miss the children terribly. I've had wonderful support from John (Whetter) throughout his time at the school and the rest of the staff and governors." Headteacher John Whetter paid tribute to Mrs Oates contribution: "Jean has been a great support to me personally as Headteacher, because she was chairman of governors throughout my 13 years at the school so far. "She has always shown a great interest in everything the children have done. She's spent a lot of time with them in school and out of school on trips. "We hope she will continue to come in, albeit in an unofficial capacity." Reviving the Chamber of Commerce? There is a move in Portreath to breathe some life back into the local Chamber of Commerce. The Tram has been approached by two local business owners suggesting that the time has come to fire up some enthusiasm for this once busy and effective group. Small businesses have a strong record of contributing to their local communities including sponsoring local events and involvement in neighborhood watch schemes. Crime stunts business growth and this has negative consequences for the community as a whole. A well-organised Chamber also has good lines of communication into local authorities, parish, district and county councils. Anyone interested in helping to reorganise, build an interactive business community and become a member of the Portreath Chamber of Commerce please call Mark Savage on 01209 843931. The EatWell project aims to provide hands on support and training to community, voluntary and statutory organisations in Kerrier, wishing to increase their emphasis on healthy eating. The project is part of the Kerrier Healthy Living Centre and is based in Health Promotion Services, in Pool. The cooking session in Portreath linked with the Healthy Boxes project, which supports local farmers and growers by providing weekly boxes of local vegetables to families in Kerrier and Penwith, to give people inspiration around new healthy cooking ideas. Terry Reynard was the key link to the Incline Project and so it was decided that to encourage more people to engage with the Healthy Boxes and to provide information around healthy cooking and healthy eating information in general, a cooking session would be run with hope of continuing the sessions into the new year. The cooking session on 8th December was attended by 7 people who all seemed to enjoy the lunchtime cooking and especially the eating! We used the ‘Healthy Box’ to inspire us and cooked a delicious feast of wholesome vegetable soup, soda bread and stuffed peppers. The EatWell Project took along a wide range of healthy eating leaflets and numerous recipes for the group to take away and we talked about what can be done to improve your diet, including reducing fat and salt intakes. No further dates have been confirmed but it is hoped a couple more sessions will be run early next year. Finally, with the imminent finish of the Eatwell Project in March, the Eatsome Project, the countywide healthy eating project, could help to further fund healthy eating projects in Portreath as the project offers small amounts of funding in the guise of Bitesize Grants! These grants are open to community groups wishing to increase their emphasis on healthy eating and may be a great way in which the cooking sessions can continue, or any other projects that can be thought of….! An Extra fourteen village shops and businesses and organisations joined in the sponsorship of various aspects of the event this year. Their community spirit was appreciated and encouraging for the future. Disappointingly the collection taken during the display failed to cover the cost of the fireworks and I was very disturbed to hear of one collector being verbally abused, several times. Many other people made appreciative comments afterwards, particularly regarding the quality of the display. However at present, the 2005 Display is in jeopardy. On a personal level my thanks to the sponsors, the team of collection stewards, the Bar-B-Q team, St Johns Ambulance, First Bus Co, The Gold Centre and the Community Police team who all worked hard to make this a happy and safe event. We are writing this from all the Mish Mashers. Our names are Brendon and Becky. On the 4th December we held a community feast (thank you to the Healthy Living people for giving us the money to do this). We got the food ready and made banana, melon, strawberry and raspberry smoothies in our new smoothie maker. We welcomed people at the door with fruit warm punch. We had written letters to people to ask them to come and Candy Atherton came, the police workers, and the vicar, and Mr Whetter as well as lots of others people from the council and our families. We liked having letters from people to say if they were coming as the letters came to the school. We had Jason come and do African drumming and Mike to do juggling with us, the grown ups joined in and this was funny and fun! Mike did juggling over our heads while we lay on the floor but not the grown ups. We showed everyone what we had made and brought such as our new books and puppets and the felt and silk we had made. We played Christmas music and made craft and ate the feast. We really like Mish Mash because it gives us something to do on weekends and also we like running it and choosing what to buy and do. Some of us went shopping for the food for the feast and we all chose two things we wanted to have at the feast. We like to run around and play with bats, balls and hoops as well as talk and do new stuff. The Old Harbour Masters House on Harbour Terrace: A success story – so far! As many people will be aware, a planning application was received by Kerrier District Council Planning Services to renovate and considerably extend this historic building at the beginning of October. The proposals would have transformed the present 3 bed 2 bath house into 6 bed /3 bath accommodation by adding another story to the rear and opening up and enlarging the roof space thus completely changing its profile from all aspects. In addition the classic view of Gull Rock along Harbour Terrace would have been lost to all. Local residents in Harbour Terrace, Kingsley Terrace and Lighthouse Hill decided to oppose the application as it stood whilst supporting appropriate renovation of the building. They went in force to the Parish Council meeting where it was being considered and presented their various views. The Parish Council decided to oppose it. They were also able to enlist the help of Portreath’s County Councilor, Terry Rowe, and the District Councilor who represents Portreath’s interests on Kerrier Planning Committee, Tommy Bray. I think the most powerful argument was the historic nature of the house and its environs. The harbour, the Harbour Masters House and the Harbour Terrace properties are closely related and date back to the 18th century and earlier. They are the last group of related 18th century historic structures to survive in Portreath. The Harbour is a grade 2 listed structure and the Harbour Master’s House lies within its curtilage. They both lie within the proposed World Heritage Site area. So the World Heritage Site team at the Department of Historic Environment at Cornwall County Council were very interested in this application. Redruth Old Cornwall Society and many others were also alerted and many letters opposing the application were sent in. We also decided to get up a petition and copies were posted in Costcutter, The Portreath Arms, The Waterfront Inn and The Basset Arms. We also went door to door and hung about on the harbour to solicit signatures. Michael Tangye did sterling work collecting signatures from Redruth Old Cornwall Society and other local organisations helped out too. Drawings of befores and afters were made so that everyone could easily see what the changes would be. Initially the petition was circulating for three weeks but this was extended for another month when we were informed that it would go before the December Planning Committee meeting, not November. The results were really encouraging as well as very interesting. Out of a total of 272 signatures 141 were Portreath and Bridge residents, a further 108 were local to the area (Camborne-Redruth etc) and 23 were from elsewhere in Cornwall or upcountry. A good number of signatures were collected in Costcutter and an unknown number in the Basset Arms – the petition fell down the back of a large and heavy fridge never to be seen again. A new petition was started but from all accounts fell far short of the first one. As to The Waterfront and the Portreath Arms, not one signature was collected. Residents from every street, road and close in Portreath signed the petition. Our concerns were heard. The applicant withdrew his application on learning of the strong opposition, which now included Kerrier District Council. The application never went to Committee. However the applicant will resubmit with more appropriate proposals, and soon probably. Then the whole process will begin all over again. I feel very heartened that so many Portreath residents care enough about their historic village to put pen to paper. I am grateful that they have not let disappointment or bitterness from past failures to protect our historic buildings make them feel hopeless. I know some do. However I am not so naïve as to think that the story is now over for who knows what the next application will be like? As we already pay the highest water rates in the country, and they are going up again because we have to clean up the beaches, perhaps certain surfers at Portreath had the right idea, after all, with their "locals only" slogan. If we are the only ones who have to pay for it, then perhaps we should be the only ones to be able to use the facilities. What a fantastic night our beach bonfire turned out to be. It was the best firework display yet, enjoyed from my favourite position standing between fire and sea, trying to avoid the incoming tide and cowering from the loudest explosions rebounding from the cliff! All of my party were very impressed, thought it must have cost a tidy sum and hoped enough money would be collected to cover costs – and donated freely when we could find a bucket to put our money in. Later I made a point of finding out if all the costs had been covered and in the process discovered what this lovely village event entails. I think everyone should be aware of this so that they can have some idea of what a reasonable donation is and so ensure that it continues into the future. Briefly the number of spectators varies between 1500 and 2000. Bonfire insurance for that number costs £200 of which £100 came from Portreath Improvements Committee and £100 from local businesses. A firework company was hired to provide the firework display and they had their own insurance for that. They charged £1500. Free park and ride was put on from The Gold Centre. A team of local volunteers collected, made and tended the bonfire and more volunteers collected the donations. So donations need to add up to the cost of the firework company, which was £1500, divide that by 1500, being the lowest estimate of people attending, and you get £1 per person. Lets assume that half of those attending are kids under 16 and should be able to pay less than an adult. Then adults at £1.50 and kids at 0.75p would cover it. A family of four would then donate £4.50. Make it a round fiver and the firework fund might even carry over for the next year. Pretty good value for a real fun night out! 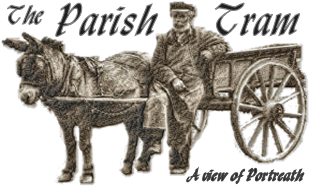 This year, even after The Parish Tram asked people to be generous for the above reasons, there was a shortfall of £75. It was a fine night and we can assume that there were nearer 2000 than 1500 spectators. So where were all the generous donations? It wouldn’t matter so much if an organisation with financial reserves was behind this, but that is not the case. It is an individual. So any shortfall is born by one person. If we want the beach bonfire and fireworks display to continue into the future we all need to be a bit more realistic and a lot more generous. I am a local girl (Portreath) who is currently in the third year of veterinary training at Liverpool University. During the Christmas break I worked at the Cornwall Animal Hospital at Treleigh, Redruth. This is a good local service that many people do not know about. I was very impressed with the quality of care and the ethics of the hospital. The hospital is a charity and relies upon donations as well as private patients to support the work that it does. They are often given animals to re-home and currently they have several cats, two dogs and a gerbil. If you can offer any of the animals a home or would like to know more about the work of the hospital, please contact the hospital on 01209 313214. Please also remember that they are always happy to care for private animal patients and this really does go a long way in supporting the wider work of the hospital. Consultations are by appointment only and the hospital is open Monday to Friday 9 am until 1 pm and 3-6pm. Saturday the hospital opens 9 am until noon and there is a 24-hour emergency cover provided. Photographs re-sized, mounted and framed. Choice of frame type and mount colour. Photographic greeting cards with quality paper inner pages, which can be printed with your own message or left blank. Give us your Christmas card list and the cards can be made out to the names and font of your choice. Corporate greetings cards for small companies undertaken. Examples of work are displayed in galleries at the Harbour Tea Rooms and in the restaurant at the Basset Arms in Portreath. Very affordable prices. We won’t make a hole in your wallet. Where restoration work is not possible we will tell you without charge.